Hailed by The New York Times as “one of the most celebrated performance artists anywhere,” Ragnar Kjartansson (Reykjavík, Iceland; b. 1976) comes to the Hirshhorn Museum and Sculpture Garden in October 2016 with an unprecedented solo exhibition—the first U.S. survey of this internationally acclaimed artist. Raised in a family of Icelandic actors, Ragnar Kjartansson draws upon his own history to create work that combines theater with experiments in repetition and endurance. Deeply personal themes such as birth, death, and family meld with satirical commentary on politics and Western culture. This exhibition features Kjartansson’s most celebrated works, including many never before seen in the US. 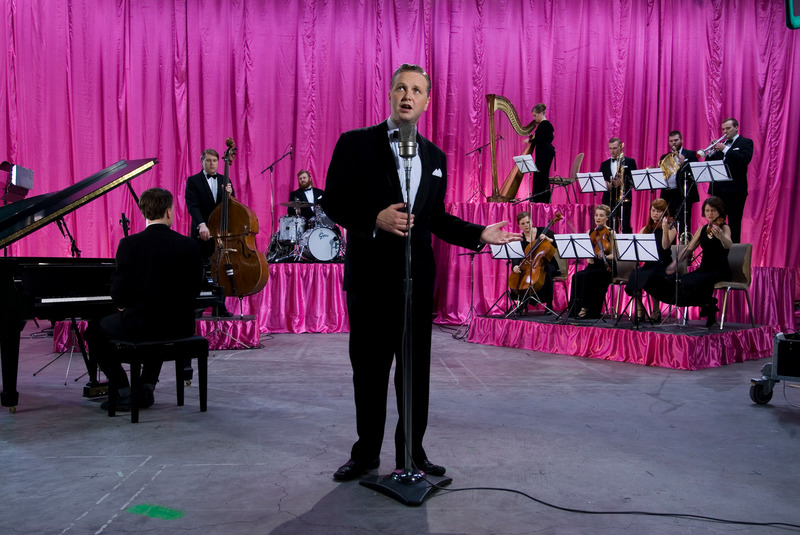 In God (2007), Kjartansson embodies a 1950’s lounge singer, repeatedly crooning, “Sorrow conquers happiness” while backed by an eleven-piece orchestra. To create The End – Venezia (2009), while representing Iceland at the Venice Biennale, Kjartansson settled in a palace and painted a series of 144 portraits—one each day—of Speedo-clad fellow artist Pall Haukur Bjornsson, tirelessly mimicking the romantic quest for inspiration. His most well-known work to date and a highlight of the exhibition, The Visitors (2012), is an immersive nine-screen film of Kjartansson and fellow musicians performing a gospel dirge while scattered throughout a decaying mansion. In a Hirshhorn first, visitors will be able to experience a live performance of Kjartansson’s Woman in E—a single, sequin-clad woman strumming an E-minor chord—during the entire run of the exhibition. A rotating cast of Washington-area musicians will play the Woman. Special screenings will also be scheduled of A Lot of Sorrow (2013-14), a recorded endurance performance in which the band The National performed their song “Sorrow” for six hours in front of a live audience. Kjartansson has had solo exhibitions at the Palais de Tokyo in Paris, the New Museum of Contemporary Art in New York, and the Guggenheim Museum Bilbao, and in 2009 became the youngest artist to represent Iceland at the Venice Biennale. In 2014, the Hirshhorn presented Kjartansson’s DC debut, screening the film S. S. Hangover as part of the Museum’s Black Box series. The exhibition is conceived and organized by the Barbican, London, in association with the Hirshhorn Museum and Sculpture Garden, Washington, DC.